California Whale Adventures specializes in Whale Watching & Great White Shark tours from San Francisco out to the Farallon Islands. Our eco-tours depart from Fisherman's Wharf and head out to the Gulf of the Farallones and Point Reyes Wildlife Sanctuary. California Whale Adventures specializes in Whale Watching & Great White Shark Watching tours from San Francisco's Fisherman's Wharf. 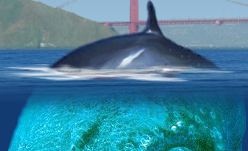 Our Eco tours depart from "The City" and head out to the Gulf of the Farallones and Point Reyes Wildlife Sanctuary. Jacky Douglas is the owner and operator of the Wacky Jacky, a 50 foot "Delta" model of boat. She is certified to carry 40 passengers. Jacky has been fishing and running boats out of Fisherman’s Wharf since 1962. She earned her captain's license in 1973 and was the first licensed female boat captain on the West Coast. Jacky has been an active chairperson with Golden Gate Fisherman’s association for over twenty years. - "The ocean and my boat give me life, energy, caring and happiness"